NIFT 2019 Application Form: National Institute of Fashion Technology (NIFT) is going to schedule NIFT 2019 National level Entrance Exam to offer admission in B.Des, B.F.Tech, M.Des, M.F.Tech and M.F.M programmes in any of the 16 campuses. 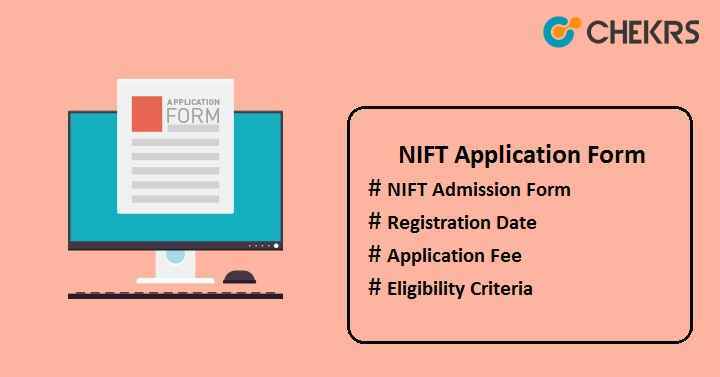 Latest update 22 October: NIFT 2019 Registration Begins!! Check The Procedure Below to fill the Application Form. Latest update: NIFT 2019 Schedule Announced!! Check the Dates Below. The university will conduct two exams i.e. CAT (Creative Ability Test) and GAT (General Ability Test) and based on the score of these exams, aspirants will get admission in the course of their choice. 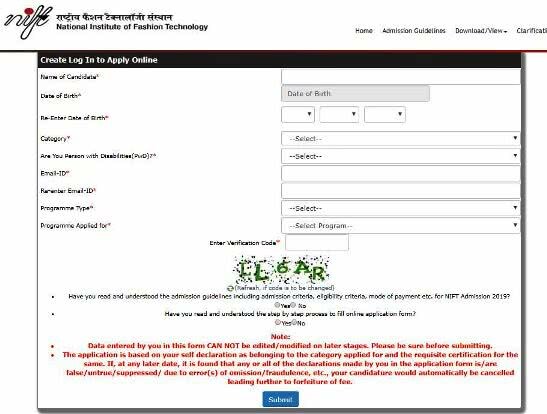 Aspirants who are interested to Apply Online can check the complete information related to NIFT application form, eligibility criteria, exam dates etc here. Candidates are suggested to go through the following NIFT 2019 Admission Calendar. Candidates applying for the NIFT examination must ensure that they satisfy all the NIFT Eligibility Criteria for admission in any of the 16 campuses. If it is found that, candidate does not fulfill the eligibility criteria prescribed by the official authority, then their application form will be rejected and admission will be cancelled without any notice. Completed 12th with Physics, Chemistry & Math from any recognized board or state board. Or BE/BTech from any recognized university/ institute. Should have undergraduate degree in any discipline from any recognized university/ institute. Now You Will Need To Do Registration First And Here the Procedure to Do Registration. Click on the link of admissions from the home page. Once the admission menu is open, click on New Login or Login to Your Account. Fill all the details like Name, DOB, Category, Program, Email and Solve the Capache in the Registration Form. Tick on the two round boxes which will be under the Capache, To verify you read and understood the admission guidelines including admission criteria, eligibility criteria, mode of payment etc. for NIFT Admission 2019 and Second is one for that you understood the Application form filling procedure. Now You will receive a Confirmation Email to verification. So open inbox and click on the link in the Email. And Login Here Using the Email and Password. Now You will Access the application Form Fill it and Save it. After it you will be redirected to the Payment Page. After Filling the form and Submitting the fee, Download the filled application form. Willing aspirants can check out Summarized NIFT Admission Form filling process from Here. It will redirect to the home page. Go to “Admissions” option from the home page. Click on the link present there for the NIFT Registration Form. Fill the all basic required details like name of candidate, date of birth, mobile no, mail id etc. and then submit it. Login to your account by entering the user id & date of birth generated after the registration. Fill the application form with all required details and then click on “Save” button. Moving forward on the application form, upload the scanned images such as photograph & signature of format jpeg/ jpg and file size must be not exceed than 50KB. Click on “Next” button, to proceed to the next step i.e. payment process. Pay the application fee as per your choice of mode. Click on “Submit” button to submit the application form to complete the process. After final submission of the NIFT Admission Form, no modification or correction will be done. So must preview the application form before the final submission. Aspirants will be able to correct their application form from the End week of December 2018 to First week of January 2019. Application fee paid will not be refundable or transferable in any circumstances. The fees will be same for all courses. I hope the details provided here regarding the NIFT Admission Form, criteria to fill the application form, application fees are sufficient for the aspirants who will apply for NIFT 2019.